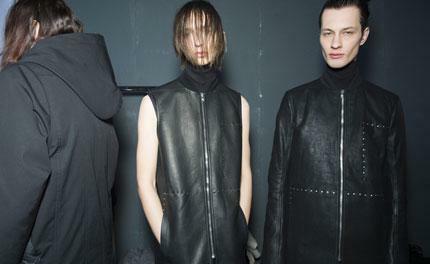 Mood board: Rick Owens called his autumn show 'Sphinx', and dressed his mythical gatekeeper in a uniform so subverted that you may never look at a peacoat in the same way again. Opening with that nautical staple (cut from blasted leather or Berber blankets, no less), he riffed on pieces as close to classic as he has ever dared, exaggerating their trapeze flare until he turned it upside down, hung it from the neck and traipsed it out sans trousers as a dramatic cutaway tunic. Backstage, he associated that mariner theme with a French submarine film, which he later explored through the more abstract notion of 'compression'. It explained the way coats appeared ready to burst with mesh-covered quilting. Best in show: Amongst the beautiful mix of editorial fodder, a series of vented cashmere and Melton wool blousons featured severe, artful paneling down the torso. With a touch of satin quilting winding beneath the arms, they too 'compressed' the season's message into wearable, covetable outerwear. Finishing touches: Owens' recent Adidas footwear collaborations have erred far more on the sportier side than this season's opulent design - those ergonomic rubber soles, this time transferred onto a stretchy sock boot in butter soft suede.